Early morning on DS19, the station is quiet, a few “night-owls” stroll along the promenade deck, some coming from Quark's some on their way to the popular Ferengi establishment. One night-owl walks into Quark's expecting to hear the usual cacophony of voices in conversation, the loud clinking of glass upon glass, and shouts of “DABO” followed by the laughter of the winners and the grumbling of the losers. But it is as though she has suddenly lost her hearing. The sounds she hears are quiet whispers, soft laughter and polite conversation with the occasional clink of glass upon glass. Looking around she blinks her eyes to verify in her own mind that she is truly in Quark's and not in the Bajoran Temple and Meditation Room. She notices photographs lining the second floor walls of Quark's and the patrons of the establishment moving from one photograph to the next pausing to read the words that adorn the photographs. The night-owl stops at the bar, orders a Saurian Brandy, her favorite drink, and walk up the spiral ramp to the second floor to see what everyone finds so interesting. POETRY! Haiku poetry at that. Verses of three lines containing five syllables, seven syllables and five syllables again. “But they don't even rhyme!”, exclaims a slightly more than inebriated patron again and again as he moves from photo to photo, haiku to haiku. The night-owl enjoys the Star Trek inspired haiku and the Star Trek related photographs that were matched to each. But when she finishes reading the last haiku after her second circumference of the room, she is curious as to why there is a poetry exhibition in Quark's. Descending the spiral ramp brings her face to face with the DS19 Station Commander, Kaori Juliesse. Who better to ask then the person in charge of the entire space station? “So, Commander, why is Quark's promoting this haiku poetry exhibition? It is certainly out of character for the famous chain of Ferengi bars”, the night-owl inquires. 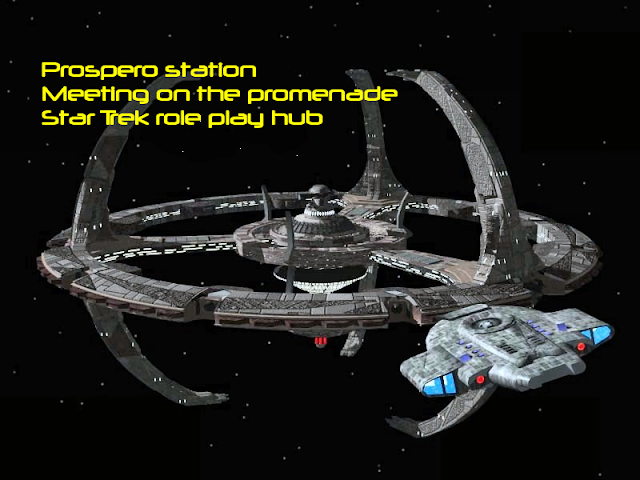 So come on by the DS19 space station in the Sovereign sim of Galaxy Fleet Command in Second Life, and enjoy the poetry and make a generous donation to the Relay For Life and help find the cure. Great post, we'll see what we can do this weekend.